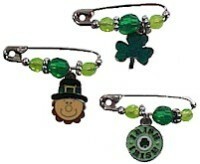 With assorted beads and Irish charms these are great to swap for St. Patrick’s Day. Open up a coiless pin wide so it is almost flat. Do not play with the pin too much or you will create a weak spot and the pin could snap. String on four silver beads, three green beads and one charm using photo above as a guide pushing them all the way to the around to the other side of the pin. Fold the coiless back to its original shape. If you are using optional SWAP* tags, write your message on the tag and slide onto the pin. Close pin. 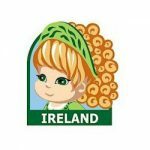 7 reviews for "Irish Charm Pin Kit -- 36 Pack"
This was the perfect craft for our troop for thinking day. Super easy to do and the price was perfect too. 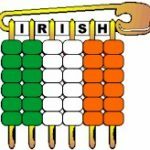 It clearly states in the description that the pins are coilless – which is a key factor in making the beads fit on with enough room to pin the swap onto something. They sent regular pins, so we could not fit all the beads on, and can’t really pin it on anything without losing the beads. Furthermore, when I emailed to customer service 10 days ago, I have not heard a response. The kit was perfect for our little Daisy troop to work with! Everything came in a nice easy to understand kit! 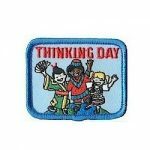 Perfect kit for making thinking day a little easier for our 1st grade Daisy Troop. Thanks! My order arrived within a week of placing it – LOVE that it came on time. It was exactly as pictured, and the quality for the price was great. As a teacher, I spend a lot of my own money, and really appreciated the value. I have already recommended this site to several other teachers, room parents, and support staff. The girls loved these St Patrick’s themed SWAPS! These came out really cute and our kindergarten Daisies loved them. I was glad to have 20 of the same type of charm because I didn’t want girls being upset that someone’s looked different.